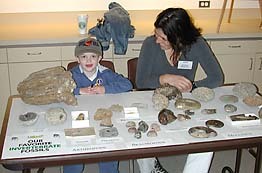 The theme was Favorite Fossils and the enthusiasm level was high as UCMP shared its science with an eager public on Cal Day, April 21. As fossil hunters were busy picking and identifying vertebrate microfossils in our lab upstairs (hosted by the Clemens and Barnosky Labs), other visitors were enjoying tours through the collections, learning about fossil preparation, and talking with the experts at our fossil display center. The invertebrate table had an array of spectacular specimens from barnacles to ammonites and corals. How can you ever leave a barnacle out of a display? exclaimed Emina Begovic, adding . . . or a limpet to appease her advisor, Dave Lindberg. The Lipps Lab shared both foraminifera and jellyfish this year, and Lisa Gershwin had a great time observing folks watching the living bell and comb jellies pulsating beneath the microscope. Plants were selected by Museum Scientist Diane Erwin and Anna Thompson and Caroline Stromberg from the Arens Lab, so there was a diverse group of specimens on display, including phytoliths, pollen, beaver-chewed wood, and an exquisitely preserved walnut. John Hutchinson selected specimens for the Padian Lab that included the fused neck vertebrae of Triceratops, a structural specialization to support its massive head, and an equally impressive upper jaw of T. rex that bears bite marksmost likely from another T. rex! did not). The take-home message was that there is much to be learned from these events, as we make choices concerning land use today. An additional note from Cal Day: We not only debuted two new tee shirts designed by Dave Smith (Generation X-tinct sauropods and a Gomphotherium skull), we also held a raffle for the dinosaur sweater designed and knitted by UCMP Friend Helen Grinstead (see UCMP News Jan 2001). The winner of the raffle was Sue Hoey of Santa Rosa, another Friend of UCMP! Congratulations, Sue!